As winter sets in, our thoughts are turning to the warmer climes of the Gambia, and thought we would share some of them with you. Our supporters are paying the school and associated learning costs of a dozen youngsters in Sohm. We have recently received upto date school reports on their progress, together with letters of thanks from the pupils, which by now are winging their way to the sponsors. Most pupils have made significant educational and social progress over the last year, as reflected in the reports and letters. What is clear, however, is that there would have been no educational progress without the help from the sponsors, because that alone has enabled them to continue with their studies. So, thanks to all who are supporting Sohm's students. For just £5 per month you, too, could sponsor a Gambian youngster's education and receive an annual school report, letter from the student and recent photo of the student. Please contact us, if you would like to join our band of supporters. This could be the ideal, selfless, Christmas present for that person who has everything! Speaking of Christmas, we'll be making one of our regular fund-raising appearances at Derwentwater Primary school in Ealing, at the school's Christmas Fair on Friday 6 December. Derwentwater is twinned with the Lower Basic School in Sohm and all money we raise through our brik-a-brak stall and raffle will be used to help restore two badly damaged classrooms in the bulging Sohm Primary school. So, big thanks, in advance (!) to the pupils, staff and parents of Derwentwater for continuing to assist their "twinned" friends in Sohm. Sandra and I will be off to the Gambia in early January for a month. As part of the preparations, we've totted up the charity's earnings for the year, and claimed our Gift Aid from the government. So, in total, we will have raised around £6,000 over the last year. About £1,000 of this is earmarked for the sponsorship of students, mentioned above. Of the rest, we have spent around £500 on getting batteries and supplies (ink etc) for the 10 laptops and printers donors have given us. These, with the addition of the 100+ memory sticks we have been given will provide a major boost for the teaching of ICT in the schools without mains electricity. We have continued our practice of topping up the book and bike funds we established last year and have bought a supply of blackboard paint, to provide for very basic needs for the schools. We will, once again, fund a school trip for all the final year students in the primary school and will continue to help with photocopying exam past papers etc. As indicated above, we will be looking to make a major push in trying to restore a couple of ramshackled classrooms in the Lower Basic School, to help with much needed accommodation there. Following press reports over recent months, a number of our supporters have asked what is happening, politically, in The Gambia. The Gambia left the Commonwealth in October, some weeks after President Jammeh caused some controversy with an appearance at the United Nations. The Gambia is also changing some of its key international alliances. We do not feel able, nor need, to comment on these events. What is clear to us, however, is that the education needs of the youngsters in Sohm remain unchanged, and we will continue, via the charity and the help of our supporters, to help meet them. Please feel assured that all donations to this charity will continue to be spent for the benefit of pupils in the Sohm schools , directly under the supervision of this charity's trustees. We know that you would wish no different. 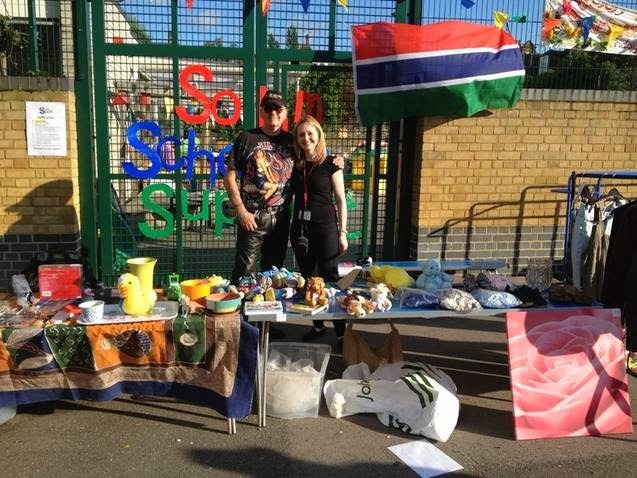 And finally, huge congratulations to Ian and Christabel Stapleton of Football Gambia - our good friends and supporters. Christabel has recently given birth to their first child, Sebastian. We are delighted to report that all three are thriving! Best wishes to you all at this festive time of the year, from us at Sohm School Support.